Working in an office environment, you can guarantee that at least a few times a month you'll walk into the galley and find an array of "treats" before you. More often than not, I dismiss them without a second thought. At the risk of sounding like a food snob, store-bought treats aren't all that enticing to me and I usually pass them up (aside from the occasional Panera bagel, which has the magical ability to turn a bad day right around!). Homemade treats, on the other hand, are a totally different story. These are fewer and farther between and when one appears, I am definitely partaking...one coworker's wife makes the best chocolate chip blondies and another coworker's wife makes these gluten free chocolate walnut cookies that I have the recipe for but am resisting making because I know I'll eat the whole batch! This pumpkin cake was brought in for Boss's Day back in October. After devouring a slice, I literally had to sit on my hands to keep myself from going back for more, releasing them only to email the baker and beg for the recipe. 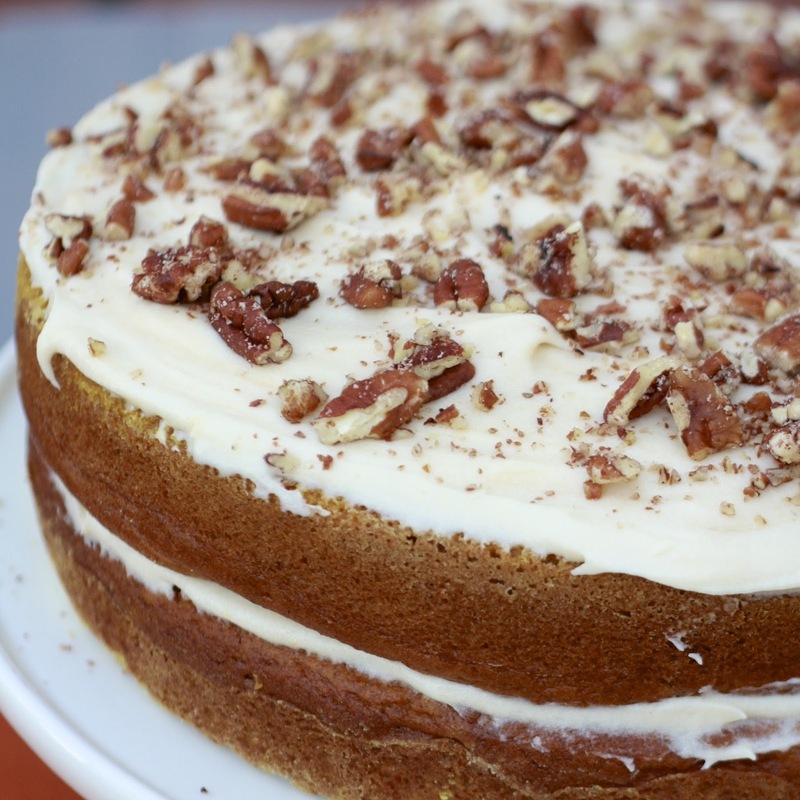 Three days later, I had an entire pumpkin cake at my disposal. If you saw my post on Instagram, you know I was tempted to keep the entire cake for myself. Gluttonous? YES, but if ever there was a cake worthy of a little glutton, this is the one! 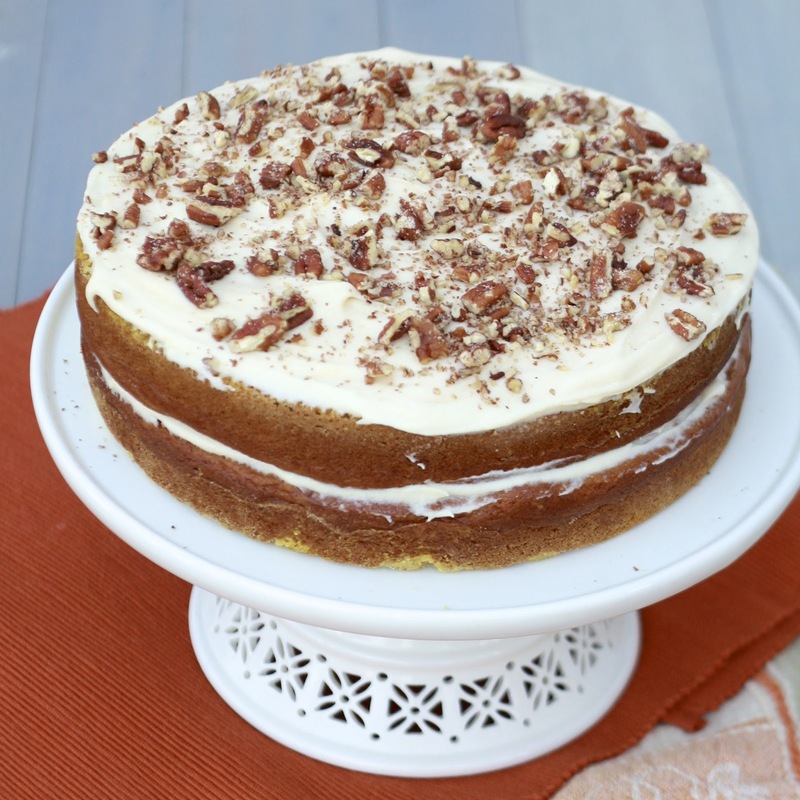 I thought I already had my favorite pumpkin cake and I'm not going to declare a winner until I taste them side by side, but today's is a bit simpler in that you don't have to worry about browning butter AND you're not trying to perfect your frosting skills--mounding it on top and sprinkling with nuts makes for a gorgeous (but easy!) presentation. Bottom line--this cake is a must make. I received texts from both my sister AND my sister-in-law praising it after leaving them with pieces. My friends from community group cleaned their plates. (Yes, I decided to share!) 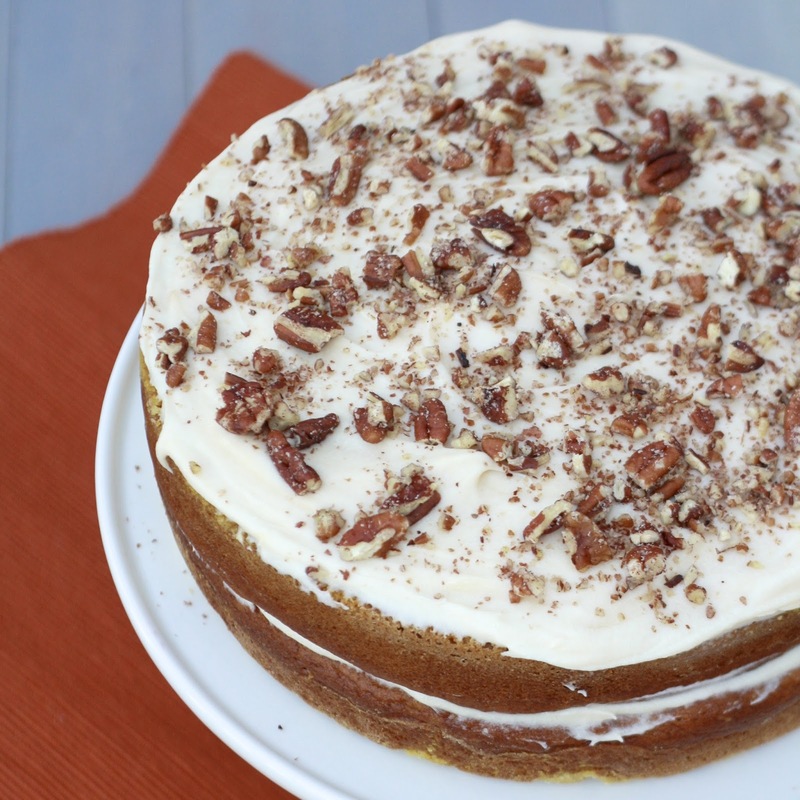 Pie is the traditional Thanksgiving dessert, but it would be a mistake not to offer a cake option as well...this cake! 1. Preheat oven to 350F. Grease and flour two 9-inch round cake pans. Set aside. 2. In a large bowl, combine the sugar, oil, and eggs, beating to combine. In a separate bowl, sift the dry ingredients. Stir into the oil mixture, beating well. Mix in the pumpkin puree. 3. Divide batter evenly between the two prepared pans. Bake for 35-40 minutes, until an inserted toothpick comes out with a few crumbs attached. Allow pans to cool on a wire rack for 10 minutes before removing cakes from pans and cooling completely. 4. To make the frosting, beat the butter with the cream cheese until smooth and creamy. Beat in confectioners' sugar and vanilla extract. Spread half of the frosting on top of one of the cake layers. Top with second cake layer and remaining frosting. Sprinkle with pecans. Store covered in the fridge until ready to serve.